Steuben’s is named after a restaurant in Boston that (owner) Josh Wolkon's Great Uncles, Max and Joe, opened in 1945. Steuben's became a famous Boston restaurant, nightclub, and hotspot from the 1940’s to the 1960’s on Boylston Street. The Vienna Room, The Cave, and The Blue Room were all part of the Steuben's space and hosted Big Bands, Jazz, and Swing groups along with The Rat Pack, Proms, Sweet Sixteens and more. In its prime, Steuben’s was the center of the Boston dining and nightlife scene. Steuben's, Denver, is a restaurant that respects the history of its name and the core ingredients of the American Regional classics we have attempted to recreate. These dishes are America’s cuisine and American’s interpretations of the dishes of our diverse cultural heritage. We have enjoyed the endless debates, opinions, stories, research, consultations and food memories that have led us to the opening version of the Steuben’s menu. Eat at Steuben’s. Take-Out from Steuben’s. Drink at Steuben’s. Feel at home, in Denver, at Steuben’s. Ace features three unique spaces, housed in the old Storz Garage space at the corner of 17th & Pennsylvania. Like it’s sister restaurants, Steuben’s and Vesta Dipping Grill, great attention was given to the design of Ace. Repurposed and recycled materials are used throughout the space to create an industrial design and comfortable setting that compliments the history of the building. Ace received the Mayor’s Design Award shortly after opening in the summer of 2012. The fun and lively energy of the Ping-Pong hall carries itself to the outdoor Pong tables, picnic tables, and into the dining room. Ace is a different and affordable night out. A drink on the patio, a casual dinner at the Chef’s Counter, and some laughs over a game of Pong combine to make Ace a totally new and unique concept to Denver. Ace serves Asian inspired dishes conducive to sharing, drinking and hanging out. Shortly after establishing Ace’s bar program featuring house made sodas, fresh juices, Asian beers and craft cocktails, bar manager, Randy Layman was recognized by 5280 Magazine’s as Denver’s Best Bartender. 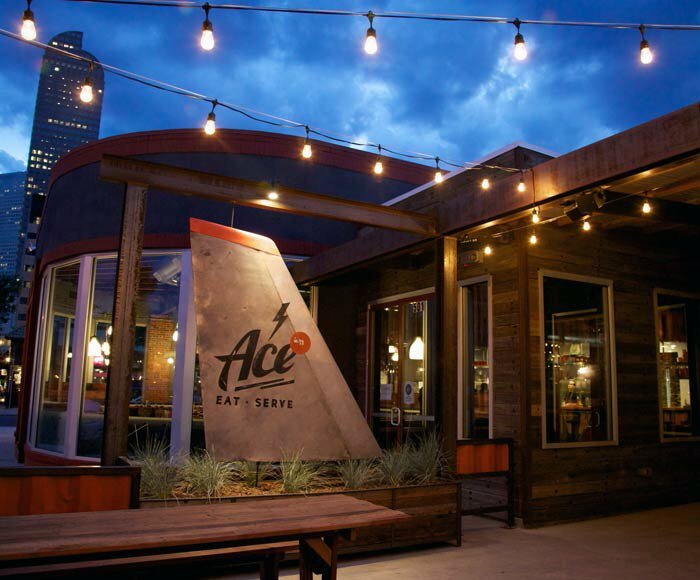 The inspiration for Ace came from the love of doing great food in unique spaces, located in vibrant Denver neighborhoods. The design of Ace uses reused, repurposed, and recycled materials to create an industrial design feel that complements the history of the building. In 2010, Steuben's unveiled Pearl, one of the pioneer trucks in Denver's street food revolution. Faithfully recreating the dishes served at the brick and mortar establishment, Pearl quickly became a favorite around town, receiving perennial nominations for Westword's Best Food Truck and 5280's Best Street Vendor awards, placing 4 of these awards on her mantle thus far. The Steuben's Truck is available for weddings, concerts, company parties, and other private bookings in Denver, Lakewood, Wheat Ridge, Arvada, Westminster, Commerce City, Aurora, Englewood, Littleton, and Greenwood Village. On the streets of Bangkok, mobile bars converted from VW buses are ubiquitous. It was during a research trip to Thailand that the team at Ace Eat Serve was inspired to bring the concept back to Denver. Once home, the search for a VW bus was on. Enter Penny- an ordinary, 1978, cow-printed Volkswagen Bus transformed into the Ace Bar Bus. Tasked with bringing Ace's noted bar program on the road, Penny's roof opens up to reveal a full-functioning, stainless steel bar suitable for two professional bartenders to serve beer, wine, and craft cocktails. She's even been outfitted with a top notch sound system to make her the perfect all-in-one party solution. Penny is available for private parties and events and, when she's not out on the road, can be found parked on the Ace patio. Check her out during your next visit to Ace! 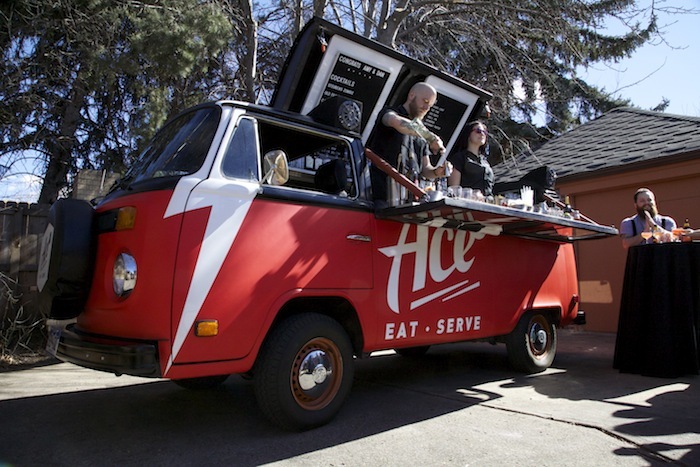 The Ace Bar Bus is available for private parties and events around Denver and most surrounding areas.